Summer in The French Alps; Which Resort is best? To say summer has arrived would be an understatement, but summer is definitely arriv-ing. In process of. In a mixture of cloudy rainy days and then the odd sporadic sunshine, fooling you into a false sense of security that it’s here to stay. As I’m sure you can imagine, May and June are extremely quiet in ski resorts, with the towns mainly closing. The odd restaurant may stay open and the local shop will often open for a couple of hours in the morning. This is serious down time and recovery from the winter, and it’s well needed for both the residents and the land to breathe again after the heavy footfall of winter. If you need to get away from a busy city, or a difficult time in your life, this is the time to escape and take some real time out from civilisation, and be forced to just sit, read a book or walk. When the resort has had time to replenish itself, July comes around soon enough and the lifts whir back into life, opening up the access once more. But summer has a very different feel. As you’ll see in my blogs from last summer, it is a new way of life. Everything is more relaxed, it’s quieter, and everything slows down. But the exact pace of life in July and August really depends on which resort you’re in…and hence, the reason for this blog! 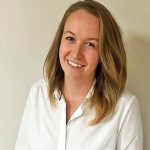 If you’re thinking about buying property in The French Alps then I would imagine your first priority on the decision of which resort to settle in would be your love of skiing; and therefore which resort appeals most to you in ski terms. However, as summer starts to boom and more people discover our best kept secret (most of us come for winters, but it’s the summers that keep us here now), it may be that having a summer home adds a whole new dimension to the property that you never expected. The majority of ski resorts offer a plethora of similar activities, the main ones being hiking, climbing, horse riding. Then you have the ‘standard’ sports often available such as white water rafting (putting the glacial melt to good use! ), tennis, cycling and mountain biking. Summer is also a great time to visit a mountain refuge, as you don’t have the chill factor associated with winter (these are scattered around the French Alps). There is a big emphasis on water sports, even more so than the ‘norm’ in the other resorts. With lots of kayaking on Lac Montriond and Canyoning, there is even Scuba Diving in the Lac des Dérêches and surrounding areas. If you fancy your thrill on-land, then look no further than the luge located by Pleney gondola in Morzine Centre. Let’s first not overlook the Glacier skiing in Val d’Isère and Tignes. From 3 June to 13 July, and from just €28 per day you can ski the Glacier and get your winter fix. A sure bonus for anybody who is totally ski-crazy. Other highlighted activities are off-road driving, and a neat little driving track for children to scoot around. Last but not least, who needs horse riding, when you have…donkey treks! We should also here note the proximity to summer-established Tignes. Tignes has put a lot of effort into Summer for many years now, and was one of the first resorts to really establish themselves as a viable option for a summer holiday. From the infamous lake slide, which has been their predominant marketing image for many years, and as well as offering the usual activities, you can also partake in thrilling sports like Bungee Jumping. 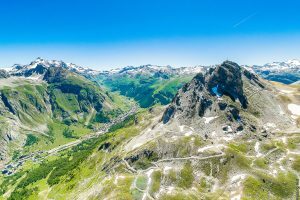 Aside from activities, in Tignes you’ll find a much busier time in the summer, and more of a ‘hubub’ if that’s what you’re looking for from a summer holiday. 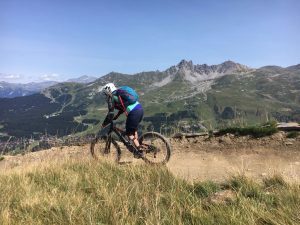 Check out our blog ‘How to spend two summer days in the 3 Valleys’, and also ‘Méribel Mountain Biking’ for more in depth information about summer in The 3 Valleys. Méribel and Courchevel’s access is its biggest selling point. You’re such a short drive from the many villages of Courchevel it really opens up options. As for other activities, expect white water rafting in Moûtiers or Centron (connected to Aime-la-Plagne), but closer to home nip across to Le Praz for some wake boarding or water skiing. Expect a lazier atmosphere, with a LOT of mountain and road bikers. Connected to The 3 Valleys, St Martin is the more traditional French Alpine Village, so offers something quite different to the British-Founded Méribel. If you want a more quaint and rustic Savoyard feel, then this is the place for you. With beautiful old buildings and narrow streets, St Martin has access to the ever-popular summer activities, but also offers something more. Try your hand at an art workshop, silk painting or jewellery design. You’ll find yourself more involved in French culture, and it certainly feels a far cry from a British-populated ski resort. Whichever resort you choose for your getaway location, with the lack of snow covering the roads, all of the resorts are very accessible, meaning you can pick and choose as you wish! Enjoy!